Wheat is an annual plant; it dies after setting seed. Each year, the farmer has to prepare the land, sow seed, fertilise and protect the plants. When the ground is bare, between crops, wind and water can erode the soil. 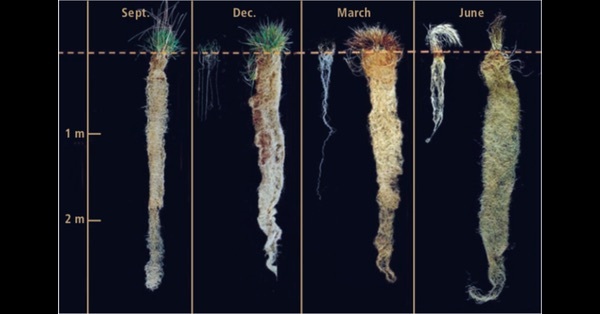 The shallow root systems of annual plants fail to exploit the resources of the soil and do little to improve it. So although wheat feeds us, it does so at considerable cost to the environment. It isn’t sustainable. What if wheat were perennial? Photo by Jerry D. Glover; annual wheat on the left, Kernza™ on the right. @wcgraeber Thanks. I will investigate. Right on @eatthispodcast! Kernza is propelling forward our diet and how we treat our soil. Great research happening in Wisconsin with @west_madison_ars graduate students. Jessie Shaw liked this article on instagram.com. Alchemy Distillery liked this article on instagram.com. Scott Shanesy liked this article on instagram.com. Jeanne Kessira liked this article on instagram.com. julkastelmaszyk liked this article on instagram.com. Caitlin Swim liked this article on instagram.com. 🍋☕️W A L L Y 🍵🍊 liked this article on instagram.com. Joel Ball liked this article on instagram.com. SweetCola James liked this article on instagram.com. Chef Kelly Unger liked this article on instagram.com.